Posted on November 17, 2012 by Bree M.
I finished my final sort and labeling of the folders today. The final FCC collection rests in 3 boxes. Since much of the material was originally scattered in random boxes and mislabeled or non-labeled folders it was difficult to maintain original order of the materials. I sorted the commissions, departments, committees, conferences and meetings alphabetically (for the folders) and then by date (within the folders) For the members papers I kept them in their original order as far as subject, but then ordered them by date as best I could within the folder. There was one whole section for the Greenwich Conference on Church Union that was the conference’s papers all in a bound folder like thing. That is the only thing that definitely kept its original order. 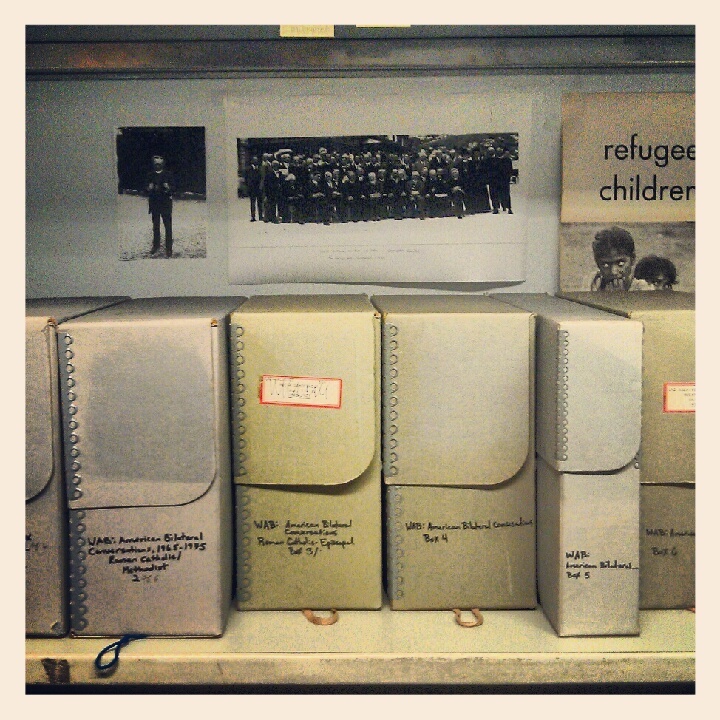 I moved the papers into 4 new folders with a photocopy of the title of the original bound folder. Next week I will finish the history portion and scope and contents note and submit it to Brigette and Ruth for final approval and then do DAM and cataloging. I might work on the history and blog post this weekend at home. My final collection will be the State Council of Churches Records. Posted on September 30, 2012 by Bree M.
I did much the same stuff that I worked on last week Friday. I was able to finish the first 2 1/2 boxes. I am amazed at how long it takes to relabel things so that my handwriting is neat. I am anxious to get back to finishing this part of the organization. I am really enjoying it, more than I thought that I would. I am getting nervous about the finding aid though. I have done a little research and as far as I can tell “American Bilateral Conversations” is not an organization but more of a label linking like documents together. I think I am going to have to do a little bit of research on each of the organizations involved. Like “The American Baptist Convention’s Commission on Christian Unity and the Bishops Commission for Ecumenical and Inter-Religious Affairs.” It’s quite a mouthful and I’m not even sure I’ll find anything on it. The more interesting part of all of this is to come. I hope I can write something that makes sense and is useful. 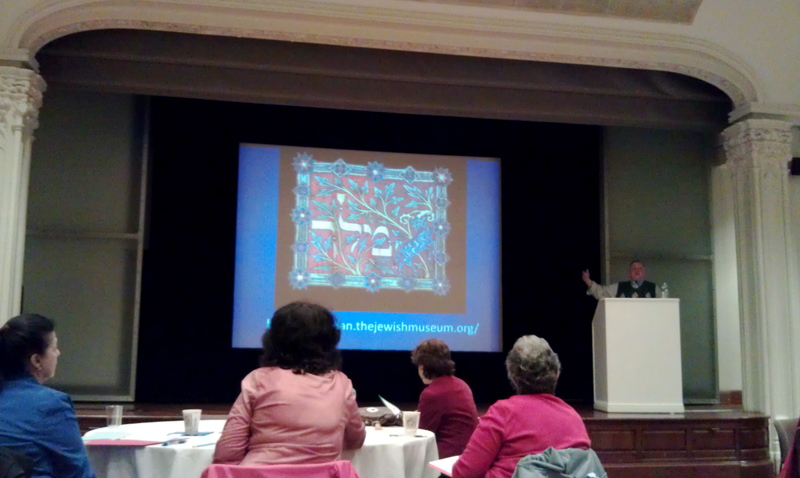 Crossing Borders lecture by David Wachtel, Senior Consultant for Special Collections at The Library of The Jewish Theological Seminary and Senior Consultant for Judaica at Sotheby’s. I was so impressed with this exhibit, it is fantastic. Crossing Borders is done in conjunction with the Bodleian Library. I am sitting here trying to describe to you what is in this exhibit and I’m finding it difficult to pare it down into a small journal entry. I think a quote my tour guide gave the group sets up the idea behind the exhibition quite well. “Writing did not take place in a vacuum, but is a reflection of various cultures and propensities of various times and it provides a window on the mentality, preoccupations and tastes of the people who were responsible for it in it’s variegated forms.” ~Leonard Boyle, Oxonian Latin palaeogrpaher. 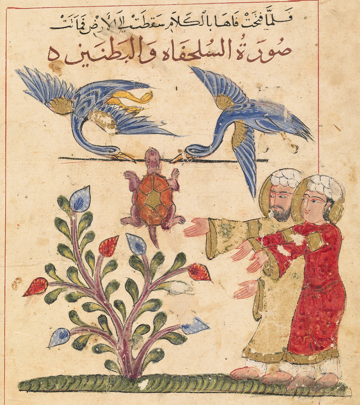 These manuscripts are not only beautiful, they are evidence of more than just what is written down in them, they show the prevailing artistic tastes, cultural mores and give a window into the minds of people who created them. They are more than words on a page they are proof of individual tastes (one example was from a manuscript that was illuminated by the owner himself) and history. I enjoyed the lecture. I loved how they were able to integrate modern technology seamlessly along with these old manuscripts. A number of iPads were located in each room. Each one contained high quality images of other pages of the books on display. One room contained around 6 iPads all to show each page of the Kennicott Bible that was on display. You could zoom in and look at tiny details. It was wonderful. I hope I get a chance to go back and look at things a little more carefully. This fable was about Chatty Turtle, who fell from his ride after making comments about people who were passing by. Moral: Silence is golden. Posted on September 22, 2012 by Bree M.
I began with the Protestant conversations series, since that is only one box and I figured I’d be able to go through it faster. That was a misconception. It took me most of the 3 hours to go through and organize that one box. Only because there were a number of loose articles, that needed to be placed correctly. Thankfully there was a “List of Conversations” that I had found as I was making an inventory of the contents. Using that list I was able to not only determine which conversations the articles were supposed to go to, but I could also place authors with the articles. Granted this is the catalog librarian coming out in me and it is really the researchers job to figure that information out. In the end the articles will go in the correct folder and while I know the authors of the papers, that information will probably not make it onto the finding aid. Thankfully that “List” will be noted at the very beginning of the Finding Aid and it will be the first folder in the collection. I got through this box and the very first box of Roman Catholic Conversations with the American Baptist Convention. I put post it notes on the boxes to state their new number and I also made a note of the topics of any significant papers in each of the folders. This is to help determine if the collection is going to be organized according to date or topic. I also made a list of books that are going to be separated out of the collection. These books were cross referenced with CLIO to make sure they were part of Columbia University’s collection already. They were also cross referenced with WorldCat to determine if there were other copies in other locations. So if there was a pamphlet that was available offsite at Columbia, but the only other copy was in the Netherlands, we decided to keep the pamphlet with the collection regardless of the fact that it could have been requested through CLIO. I am keeping track of the books by grabbing citations via Zotera (an app that will grab the citation information of reading material and save it to a library on their server, which you can later use to form a bibliography.) I copied the bibliographical information from Zotera and made a word document entitled “Separated Items.” I also listed the Columbia Libraries call number and bibid number. This way the location and presence of the books in the library can be verified before the books are officially separated from the collection. A notation of the presence of these books will be noted in the finding aid and the exact list of separated items will be placed in an appendix at the end of the finding aid. I finished with the reorganization of the folders. I continued with my same method, as I moved folders from box to box. I also continued to make a note of the topics of the articles within each folder. Although about half way through the rest of the reorganization I had determined that it would the wise decision to organize by date and just make a mention of notable topics in the finding aid. I also continued checking CLIO and WorldCat on the books included in the collection to determine if they were to be separated out or if they were to remain a part of the collection. In the end there are around 15 books that will be separated out of the collection. Credit to WAB: American Bilateral Conversations Records, Series 1, Box 4, Folder 16, The Burke Library Archives (Columbia University Libraries) at Union Theological Seminary, New York. I like the simple realization that what these church leaders are attempting to do isn’t easy, but that division is a problem worth trying to fix. I love Glenn E. Baumann’s statement about the right to worship within Inter Christian marriages. Credit to WAB: American Bilateral Conversations Records, Series 1, Box 5, Folder 2, The Burke Library Archives (Columbia University Libraries) at Union Theological Seminary, New York. Monsignor Henry G. J. Beck has similar desire for unity rather than division on this same topic. Credit to WAB: American Bilateral Conversations Records, Series 1, Box 5, Folder 4, The Burke Library Archives (Columbia University Libraries) at Union Theological Seminary, New York. I don’t know if you can read the words that are “carroted” in at the end but it says “respond creatively to…” It is obvious that unity in all aspects was a difficult task. I just like this last quote. I wanted to just give you a taste of what is in this collection. It is fascinating and relevant even today, as ecumenical discussions are still on going, so of the topics remain the same and some of the topics are new, but the idea behind unity in the church is still a driving force. I began the process of re-housing the material and starting the finding aid. After a discussion with Brigette it was concluded that organization will be in two series (Series I: Roman Catholic conversations and Series II: Protestant Conversations.) Within those two series it will be alphabetical according to denomination and then by date. Since that was how my initial re-organization was set up, it is now a fairly easy process of recording on the finding aid each box and it’s folders, as well as labeling new legal size folders appropriately and then removing staples and paper clips of the papers going into each folder. The staples are removed from pamphlets as well as the regular papers. I love the staple remover it is awesome. It is difficult for me to figure out how I am going to eventually be able to move to a “More Product, Less Process” (MPLP) way of creating the finding aid. I am so much attuned to item level description that it is difficult here at the beginning to wrap my head around general box description. I’m glad I am starting out on a collection that I am being allowed to describe to the fullest extent. It is not quite item level, but it is definitely folder level. I hope that I can figure out how to process according to MPLP standards. I think it might be difficult. I do have to say that I am enjoying all this organizing though. It is quite fun. Posted on September 15, 2012 by Bree M.
I started my inventory of the collection today. I was able to get through 2 1/4 boxes. To begin with I am making a very detailed inventory, since I am trying to get an idea of what this collection is about. I’ll post a copy of the inventory when I finish the job. Additionally I found out that I would be able the librarian viewing of the exhibit of “Crossing Borders” at the Jewish Museum on the 21st instead of coming into the Burke. I had to register today. I’ll talk a lot more about the exhibit on the 21st but until then if you’re interested in seeing a preview, here is an article in the NYT that talks about it. I created a work plan, [pdf] which according to the process Brigette has created to help with organization has 6 parts to it. I will summarize those points below. 6. Finding aid elements, divide into series, etc..
After I had finished I sent it to Brigette for review and then had a discussion with her regarding any points she wanted to bring out. Most of the discussion was based on the future organization of the collection and how to make the finding aid. They have a template (how awesome is that!) So I am able to just follow the template. As I noted at the end of the work plan I am going to start with just a basic organization of Roman Catholic led conversations followed by Protestant led conversations. Once that is in place I need to start checking paper topic, each research paper’s availability in other mediums to determine if the paper remains in the collection or is separated out. Once that is done I will have another discussion with Brigette so we can decide whether to just arrange the remaining materials by date or if a topical arrangement would be better for those trying to find these materials. I’m looking forward to work on Monday. Posted on September 9, 2012 by Bree M.
Today was my first official day at the Burke. I made sure that all of my passwords worked for the computer and then I was set to work writing a blog entry for the Burke Archives Blog (the link is down at the bottom of the page in the Blogroll). If you want to take a look at what I wrote here it is: “Internship for the Uninitiated Archivist.” Some of it will seem familiar from previous journal entries here, but there is some new stuff. That took up most of my time AND Brigette assigned a bunch of reading for me to go over before I’m allowed to touch a collection to process. So I have some homework. Collectivity–we need to collect in order to build collections that inter-relate and learn to work in collaboration with other institutions that have similar missions. Activism–we are active in shaping the historical record and we must advocate on archival issues. Selection–we are not just custodians of material, but active agents in creating historical record. Preservation–use should almost always trump preservation for some use is better than no use at all. Democracy–we are the public watchdog in support of access and government accountability. Service–it is the lynchpin between access and use. Diversity–we need to reflect it in our collections, as well as in the people we hire. Use & Access–use is the end of all archival effort to facilitate that we need to make our collections useful without requiring perfect answers to long term preservation. Good stuff! I want to use this speech as part of my research paper. I have 10 more articles to read (I’ll do that next time). Those articles include the processing guides by both Columbia University Libraries (CUL) and the Burke. I have not read any of the articles she has given me before, so I’m looking forward to finding out what is in them. I just wanted to begin by saying Happy 40th Birthday to me! I guess I’m an adult now. I got to spend my time today reading the remainder of the articles. Amazingly enough I was able to finish, but I feel like I need to spend a little more time on the Processing Guides developed by the Burke and CUL. I will spend a bit more time next week on that, but I am anxious to begin the collection. I read the preface and the statement of principles to Describing Archives: A Content Standard better known as DACS, which was developed as a replacement for the “skeletal” rules in AACR2. The biggest thing I got out of this reading was “respect des fonds“…in English it means provenance and original order. These two things are the backbone of archival arrangement. Basically materials must be kept together and not mixed or combined with records of another individual (respecting the provenance) and in their original order if it existed or has been maintained. Additionally the collection must be organized in hierarchical groupings like collection, record group, series, file and item. Description of the materials reflects the arrangement and the rules of description apply to all archival materials regardless of form or medium. The descriptive system must be able to represent and maintain the relationships among the various parts of the hierarchy, with the user being able to navigate between higher and lower levels of description. I was also assigned Chapter 4 “The Practice of Arrangement and Description” from the book Arranging and Describing Archives and Manuscripts by Kathleen Roe. This is a great resource to have handy when in the process of going through a collection, especially for someone like me who doesn’t have much experience. There were plenty of tables with examples and concise instructions. I took notes and made additional notations on the handout Brigette gave me, hopefully I’ll be able to apply what was in this reading. Respect des fonds and context were two of the overarching themes of the chapter. When forming context we should rely on information gathered from the collection that are REGULAR, PREDOMINANT, PROMINENT, COMMON, or MAJOR EVENTS. To underline the necessity of respect des fonds the chapter comes with many examples of forms and suggestions for arrangement. In Chapter 5 “Arrangement and Description” in Keeping Archives by Ann Pederson again the two things that stood out to me were CONTEXT and respect des fonds. The book was full of case studies which were extremely helpful in illustrating the process. I liked her suggestion that the archivist learn about all the various types of photo-mechanical reproductions…pictures show up a lot in archives, they all have different issues so it would be nice to know a little bit about them. Also she posed some questions that archivist should ask themselves as they are going through a collection to get them thinking about arrangement and context. Who created the records? Who maintained them? What type of records are here? What do they record? What are the range of dates? What are the actual dates of the records themselves? What is the arrangement and is there is basis for that arrangement? If the records are kept in volumes are they used for all the same things? Diaries or account ledgers? I thought these were great things to keep in mind. I also reviewed “Conservation Guidelines: Transfer of Library Materials to the Harvard Depository” [pdf] which gave ideas on how to take care of a number of items you’d find in an archive. As well as a couple of “Processing Cheat Sheets” and an archiving assignment that Brigette was given while she was in school to illustrate the arrangement and description process. Whew! That was a lot of reading! But good for the uninitiated archivist! I wish more of these had been included in the Management of Archives and Special Collections class at Pratt that I attended. Archivists, Society of American. Describing Archives: A Content Standard. Society of American Archivists, 2007. Print. Greene, Mark. “The Power of Archives: Archivists’ Values and Value in the Postmodern Age (with an Introduction by Dennis Meissner).” American Archivist 72.1 (2009): 13–41. Print. Pederson, Ann, ed. Keeping Archives. First ed. Australian Society of Archivist Incorporated, 1987. Print. Roe, Kathleen. Arranging and Describing Archives and Manuscripts. Society of American Archivists, 2005. Print. I’ve been at the Burke for a week and I must say the work environment is quite different after working on the 6th floor of the Frick Art Reference Library, which has a magnificent view of Central Park and at Poets House, which was beautiful in a very minimalist way. It is quite the change. Check out this slide show to see the difference.